The AFS-TEX System 2000 Active Anti-fatigue Mat is designed to relieve the strain of standing still for long periods of time, and encourage regular, small, subconscious movements which aid fatigue relief and encourage users to stand more, which can be beneficial to health. 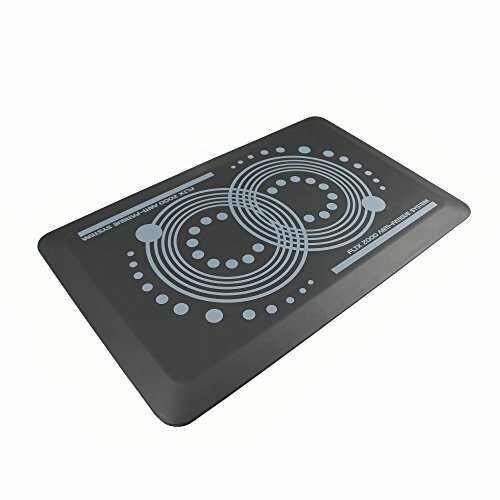 This supportive and comfortable anti-fatigue mat features an ergonomically designed print that acts as a visual cue to encourage movement to aid blood circulation and increase metabolism. The System 2000 Anti Fatigue Mat is suitable for industrial workstations, in factories and workshops. It is also recommended for use in the home, as an anti-fatigue comfort mat for kitchens. It’s the perfect mat for increasing comfort when standing at home, as a kitchen mat in front of the sink, and when ironing. The System 2000 has an anti-slip base for added stability, with rounded corners and beveled edges to minimize tripping hazards. This mat is easy to wipe clean and has the added benefit of a built-in anti-microbial ingredient which protects the mat from microbial deterioration for peace of mind. This anti fatigue mat is safe to use around children and pets and is non-toxic and phthalate free. The AFS-TEX 2000 Anti Fatigue Mat is available in a range of sizes and colors. REDUCES FATIGUE - the cushioned surface means you can make small 'micro-movements' which help increase blood flow and circulation, which significantly reduces fatigue and can aid . VISUAL REMINDERS - the unique print on the mat's surface have been designed using the principles of ergonomics, and act as a visual reminder to move, to help fight fatigue. SAFE - With beveled edging and an anti-slip base, this mat is trip hazard compliant. ANTI-MICROBIAL - a unique anti-microbial ingredient is added during manufacture. This protects the mat from microbial deterioration. Great for those who prefer working without shoes! Apache Mills Cushion Step Mat Black, 36x48"